Many DUI offenders revert back to drunk driving once their car breathalyzers have been removed, making these gadgets useless from a rehabilitative perspective. But a new pilot project shows that these devices, when used in conjunction with rehab, are effective in preventing future DUIs. A car breathalyzer, more formally known as an alcohol ignition interlock device, measures a person’s blood alcohol content and prevents them from starting the vehicle if they’re impaired. Depending on the nature of the offense, drivers must use these devices for a mandated period of time, typically a few months through to an entire year. 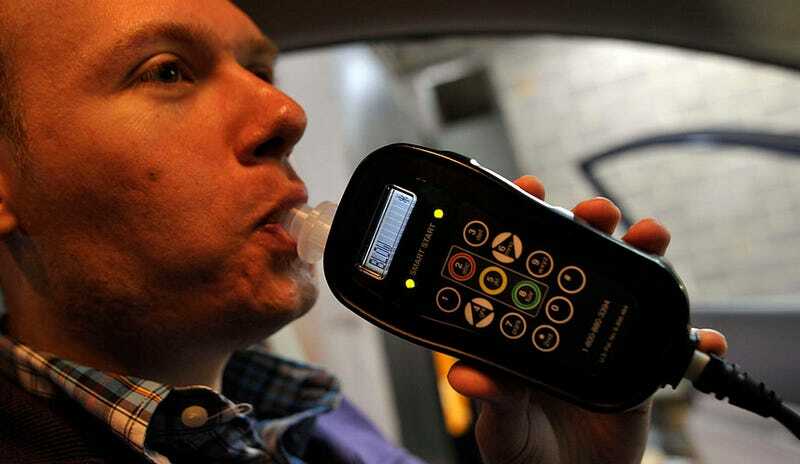 While installed, car breathalyzers reduce re-arrests for DUIs by nearly 70 percent. But once these devices are removed, drivers typically revert back to their old ways. Re-arrests for DUIs are similar to those offenders who never had interlocks installed. Car breathalyzers, therefore, are good at reducing DUIs while they’re installed, but they don’t really serve a rehabilitative purpose. At least not on their own. In a new study published in Alcoholism: Clinical & Experimental Research, researchers showed that car breathalyzers, when used in conjunction with a rehabilitation program, resulted in a dramatic decrease in DUIs even after these devices were removed. The study, led by quantitative sociologist Robert Voas from the UCL Institute of Education, followed the results of a 2008 Florida policy mandating alcohol abuse treatment classes for DUI offenders with car breathalyzers. Drivers who committed three or more interlock violations—that is, two failed attempts to start a car with a blood content level greater than 0.5 percent within a four-hour period—were mandated to attend rehab for eight to 12 weeks. To gauge the effects of this policy, Voas, with the help from the US Centers for Disease Control, the Pacific Institute for Research and Evaluation, and the Florida Department of Highway Safety and Motor Vehicles, compared two groups: drivers who received treatment while their interlocks were installed and those who just had the interlocks installed. Results showed that the 640 individuals who went to rehab experienced a 32 percent decrease in re-arrests during the 12 to 48 months afterward compared to the non-treatment group. The researchers say that the resulting decline in impaired driving probably prevented 41 re-arrests, 13 crashes, and nearly 9 injuries in crashes following the interlock removal. This study shows that alcohol ignition interlock programs should include alcohol abuse treatments to prevent future DUIs. More obviously, it suggests that all multiple DUI offenders should be sent to rehab anyway, and that these interlock gadgets are basically useless at preventing future indiscretions behind the wheel.